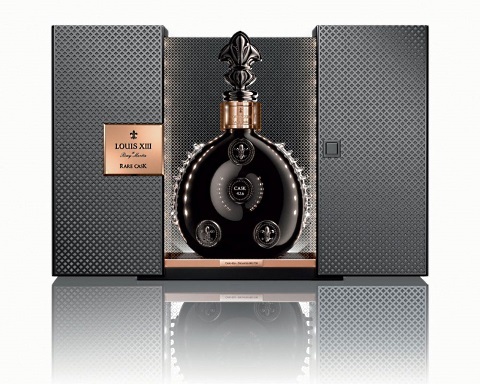 Just 738 bottles of this Rémy Martin Louis XIII Rare Cask were made, and it comes in some sweet packaging to boot. Louis XIII has long enjoyed a reputation for exclusivity and ultimate luxury, but the extremely limited Rémy Martin Louis XIII Rare Cask 42,6 redefines “next-level.” Just 738 Baccarat crystal bottles of Rare Cask 42,6 were made, complete with 22-carat rose gold detailing. In 2013, those bottles retailed for a whopping $22,000. We’ll let you digest that for a moment. But the most ridiculous part of the Louis XIII Rare Cask 42,6 has got to be the packaging. Despite what you may think, the price breakdown isn’t as simple as “a grand for each carat.” A total of 1,200 separate eaux-de-vie (colorless fruit brandies) were blended together to create it, each contributing different qualities to the final flavor. Not only that, but everything used in the making of this cognac was sourced from Grande Champagne, which is widely considered the best of the six cognac-growing regions in France. At this point in the Louis XIII-making process, each individual blend is aged perfectly for any amount of time between 40 and 100 years in special casks called tierçons. They aren’t tapped until the cellar master says they’re ready. Cellar master Pierrette Trichet determined that this particular cask had achieved perfect balance in 2012, and it was subsequently bottled. Food Republic writer George Embiricos was lucky enough to be present at a special tasting event in 2013. From the moment the bottle is opened, you can tell that you’re in the presence of something special. Complex aromas waft from halfway across the room and each careful sip reveals a new layer of flavors as the palate adjusts. We’ll stop short of calling the bottle a “must-buy” for obvious reasons, but also wouldn’t mind if this tasting was not a once-in-a-lifetime experience. Alas, with only a half glass taste permitted, the question of what a $22,000 hangover feels like remains unanswered.